Introduction: Large number of patients with heart failure (HF) have left bundle branch block (LBBB). Most precise method for identification of intraventricular dyssynchrony is tissue Doppler imaging (TDI). Purpose of this research was to compare left ventricular (LV) mechanical dyssynchrony in LBBB patients with and without HF and to compare various methods of LV systolic dyssynchrony assessment by TDI. Materials and Methods: One hundred and sixteen patients with a diagnosis of LBBB were included in the study. 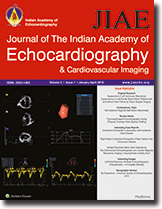 All patients underwent conventional two-dimensional echocardiography for global LV function assessment. 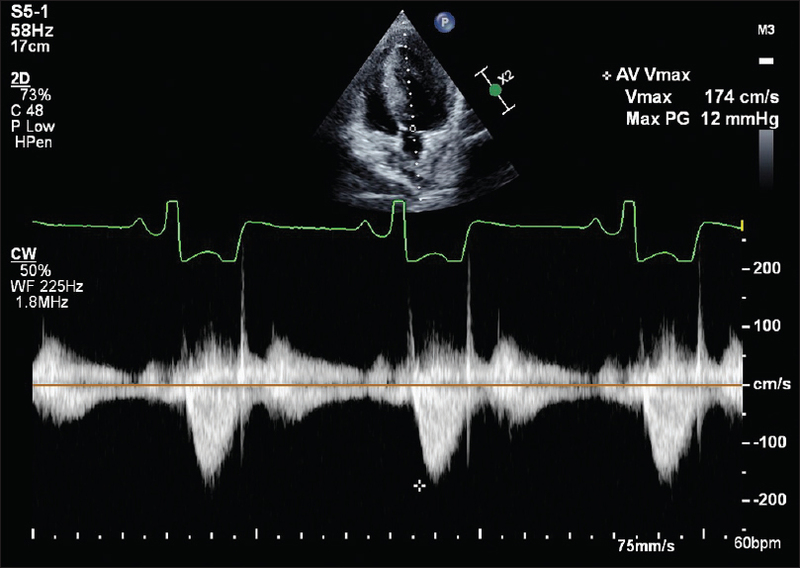 LV systolic dyssynchrony was measured by opposing wall delay, maximum delay, and Yu index. 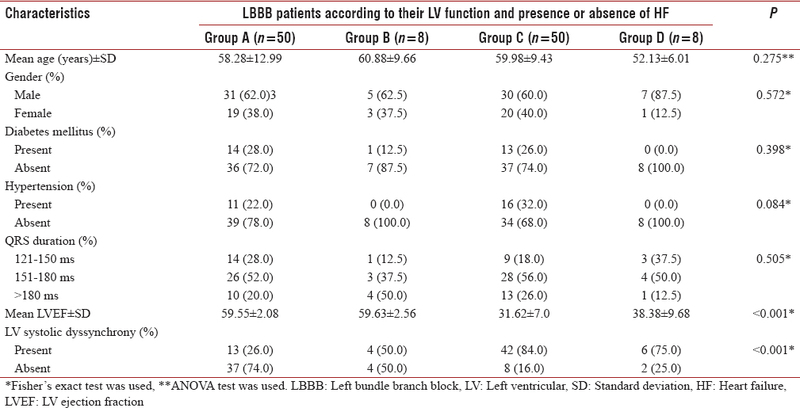 LBBB patients were grouped into four classes according to their LV function and the presence or absence of HF, normal LV function without HF (Group A), normal LV function with HF (Group B), LV dysfunction with HF (Group C), and LV dysfunction without HF (Group D). Results: LV systolic dyssynchrony was significantly higher (P <0.001) in Group C and D as compared to Group A and B. LV systolic dyssynchrony was significant higher in Group C and D as compared to Group A and B by using opposing wall delay (P <0.001), Yu index (P <0.001), and maximum delay (P <0.001) imaging criteria. Mean Yu index (P <0.001) and mean maximum delay (P <0.001) were significantly higher in Group C and D as compared to Group A and B. Conclusions: LV systolic dyssynchrony was more common in LBBB patients with LV dysfunction than those with normal LV function, irrespective of the presence or absence of HF. Regional wall motion abnormalities (RWMA) are usually described with Ischemic Heart Disease. But many other conditions also show RWMA. What are those conditions, how to recognize RWMA in them and what is it's importance is discussed. Off-pump coronary artery bypass grafting (OPCABG) is fast becoming widely adopted technique for surgical revascularization of the heart. However, OPCABG presents with unique technical and hemodynamic challenges which require additions to conventional monitoring techniques. 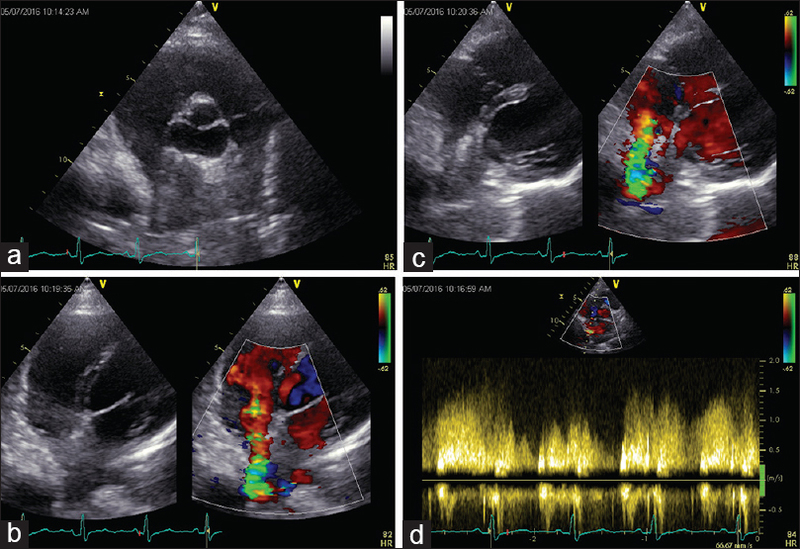 Transesophageal echocardiography (TEE) provides reliable and real-time information to monitor these challenges during OPCABG. 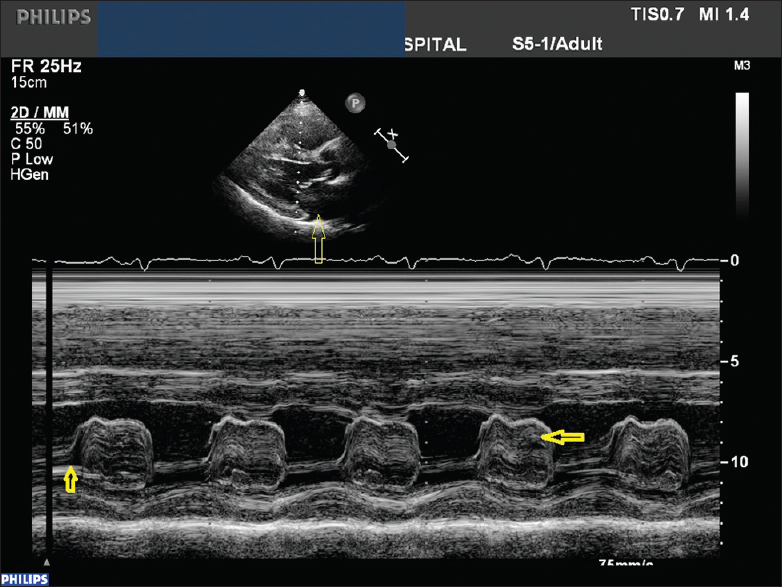 TEE is an invaluable diagnostic tool for real-time imaging during OPCABG. 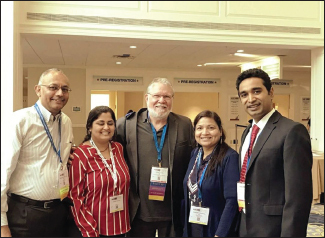 It is beneficial not only in the intraoperative period but also in the postoperative care units for better patient outcomes. Constrictive pericarditis (CP), a not so common condition, has symptoms and signs of heart failure and abnormal echocardiographic findings, such as jerky septal motion. These findings can be mistaken for ischemic heart disease (IHD) if the echocardiographer is inexperienced. 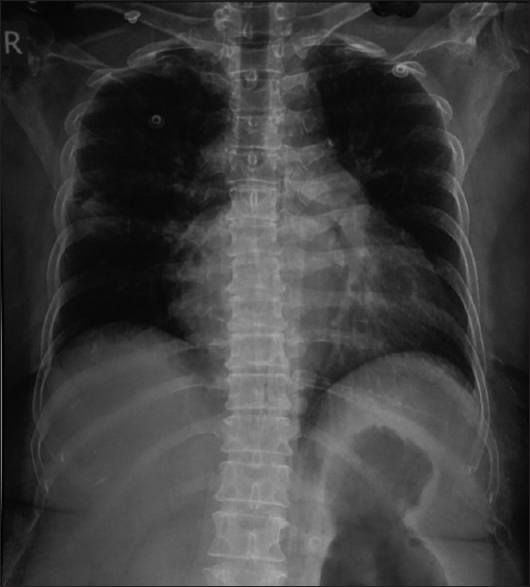 Although the etiology of CP can be varied such as idiopathic, postviral, tuberculous, postsurgical, and radiation-induced the final common pathway is the development of fibrous thickening or calcification of the visceral pericardium resulting in pericardial noncompliance, and ultimately requiring surgical intervention. As CP is potentially reversible and surgically curable condition, with improvement in symptoms and quality of life, the diagnosis should not be missed. Here, we present a case in which the diagnosis of CP was made, and subsequently found to have IHD also. Constrictive pericarditis (CP) is characterized by thick pericardial fibrosis and calcification that causes progressively impaired diastolic filling of the heart with associated symptoms of heart failure. Rarely, it can also present as localized CP and depending on the CP location, clinical presentation can be variable, including compression and obstruction of right ventricular inflow tract, coronary obstruction, or pulmonary stenosis. 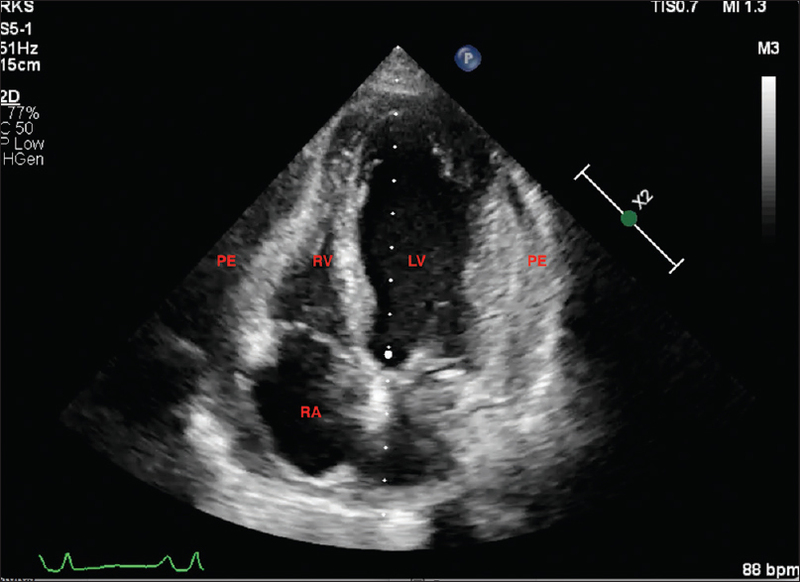 We report a rare case of isolated constriction of the right side of the heart due to loculated tuberculous pericardial effusion. A 55 year old female patient presented for preoperative evaluation for vaginal hysterectomy. 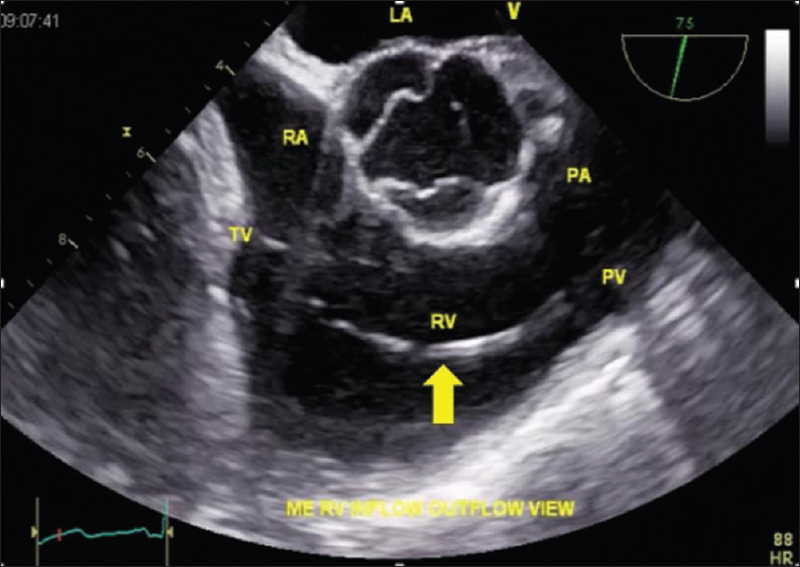 Preoperative transthoracic echocardiography revealed mitral valve (MV) abnormality, with only one papillary muscle having parachute appearance. Her cardiac magnetic resonance imaging with contrast confirmed the MV abnormality. Since she was hemodynamically stable, she underwent hysterectomy uneventfully. The azygos lobe was first discovered by an anatomist Dr. Heinrich August Wrisberg in the year 1877. It is a rare normal variant of the lung usually present over the right lobe. The azygos lobe has been reported in various case reports where it has been mistaken to be a neoplasm, a bulla, or a paratracheal mass. It has implications in the field of surgery as well when this anatomic variant was discovered during sympathectomy and the approach had to be slightly altered. We present a rare case of an incidental finding of an azygos lobe impinging over the superior vena cava and causing axial alteration of the heart. Coronary circulation anomalies are the uncommon cause of chest pain when hemodynamically significant. Multidetector computed tomography (CT) of coronary arteries is rapidly replacing conventional angiography, nowadays, as the first line of investigation for the imaging of coronary artery disease due to its noninvasive nature. CT coronary angiography in addition to diagnosing anomalies of coronary arteries is especially good in the delineation of ostial origin and proximal course. Superdominant right coronary artery (RCA) with absent left circumflex artery (LCx) is such a rare congenital coronary artery anomaly which can mimic atherosclerotic disease clinically with very few case reports in the literature which can be diagnosed and evaluated with accuracy by CT angiography. Hypertrophic cardiomyopathy (HCM) is a rare genetic disease. Usual presentation is asymmetrical hypertrophy of interventricular septum as compared to the posterior wall of the left ventricle. 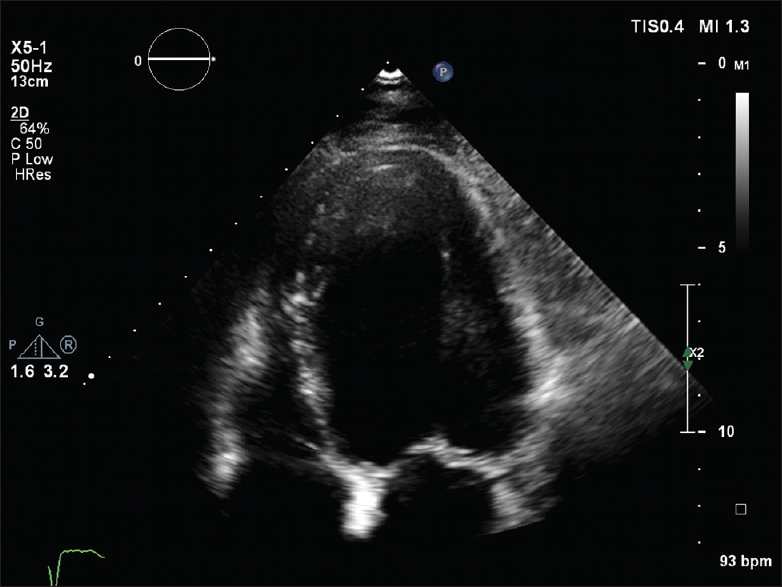 We present a rare variant of HCM in which the posterior wall of the left ventricle is more hypertrophied than ventricular septum (inverted asymmetry). Very few cases are reported in literature.